The microohmeter PME-100 is used to measure accurately the contact resistances of switches, circuits breakers, motor and transformers windings and others. The measurement is performed through the current evaluation and the voltage drop on the unknown resistance, with 4 wires to prevent against the influence of contact and cable resistances. The result is internally converted by a highly accurate and stable electronic circuit and is sent to the 3 1/2 digit liquid crystal display, allowing a direct reading in Ohms, milliOhms or microOhms, according to the selected scale. Easy to use, ideal for field, laboratory, and production line applications. - Measures the contact resistance of circuit breakers, motor and transformer windings. - Measures the power drop when current is injected in an unknown resistance. 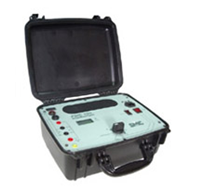 - Measurement is by 4 wires to eliminate the resistance contact and measurement cables. - Accuracy: ±0.25% of the scale ± 1 digit. - Direct reading in ohms, miliohms or microohms depending on the scale selected. - Voltage supplied by a rechargable battery or conventional voltage supply.